Check Rates & Availability at Quality Inn Columbus! 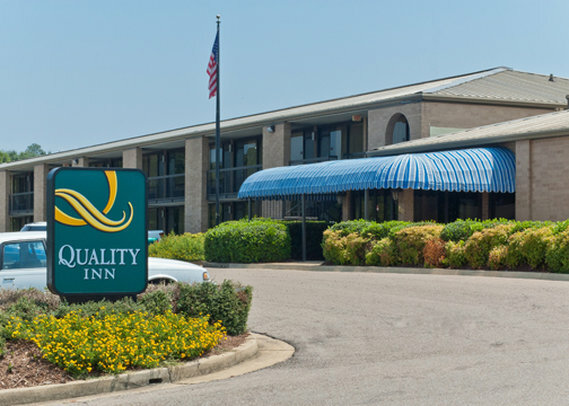 Get more for your money at the pet-friendly Quality Inn hotel in Columbus, MS, located right off Highway 82 and Route 50 near the Tennessee-Tombigbee Waterway. We are also near the Magnolia Motor Speedway, Mississippi University for Women, Lake Lowndes Park, Waverly Plantation Mansion and the Columbus Air Force Base. Get more value with amenities like free breakfast, free WiFi, guest laundry facilities and an exercise room. Rooms include a refrigerator, microwave, coffee maker, hair dryer and TV. We also offer membership to the Choice Privileges Program, which gives members the opportunity to earn valuable rewards points toward airline miles, gift cards and free hotel room nights. Pet charge: 25.00 per pet/per stay. Pet Limit: One pet/room Max of 30 lbs.